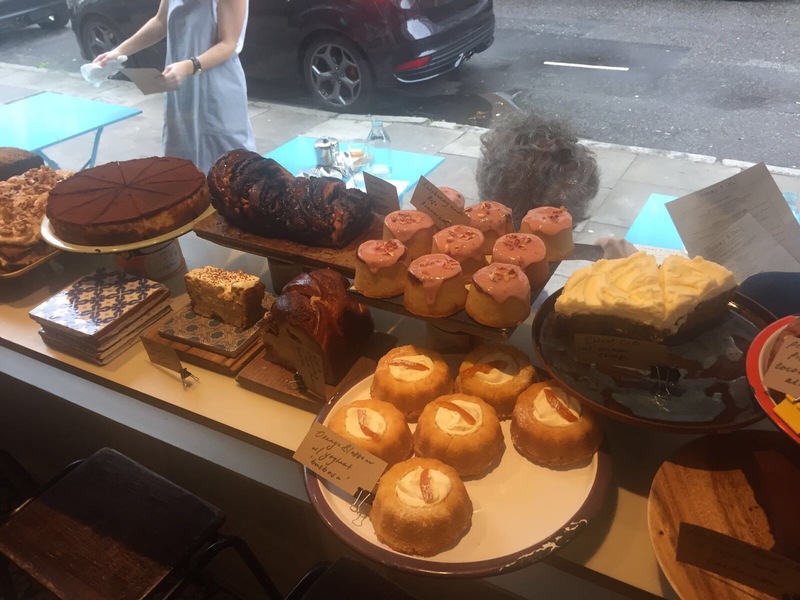 Tucked into a tiny spot along Warren Street, blink and you’d almost miss Honey & Co. Part of a wider group of restaurants/shops (including Honey & Smoke and Honey and Spice), this little place has been on my brunch bucket list (yes, that’s actually a thing!). With my friend Shilpa visiting from Hong Kong and being a fellow foodie, it was the perfect time to check it out. Sarit Packer (co-founder) was previously the pastry chef for Ottolenghi and executive head chef at Nopi. Together with her husband, Itamar Srulovich (who has been cooking since the age of 5), they opened Honey & Co.
We arrived there at around 10am and although the restaurant is very small (tables and chairs packed closely together with very little elbow room), thankfully they had a table for us. For breakfast, you can opt to have the Mezze to share followed by your choice of eggs or just go directly with the eggs. Given we wanted to save some room for their incredible looking desserts (lined up along the front window), we opted for just the eggs. We ordered the Shakshuka and Green Shakshuka to share as well as some coffees. The waitress (an enthusiastic ray of sunshine and smiles) brought our food over quite quickly. The Shakshuka could have done with slightly less oil but the combination of spicy tomatoes and eggs was divine. It was accompanied with a coriander zehung (condiment of sorts) which I found quite bitter (and I’m a huge coriander fan). 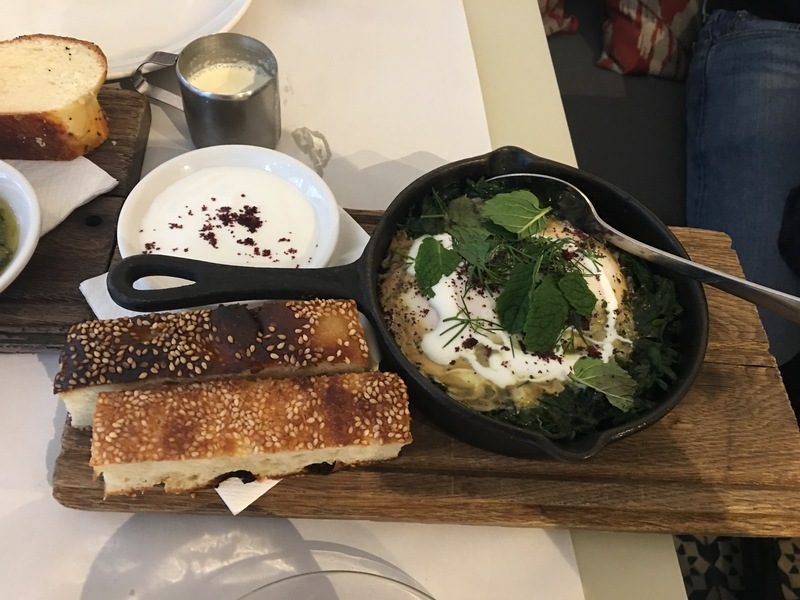 The Green Shakshuka was accompanied with a goat’s yoghurt which complemented it perfectly. My only criticism was the consistency of the eggs. 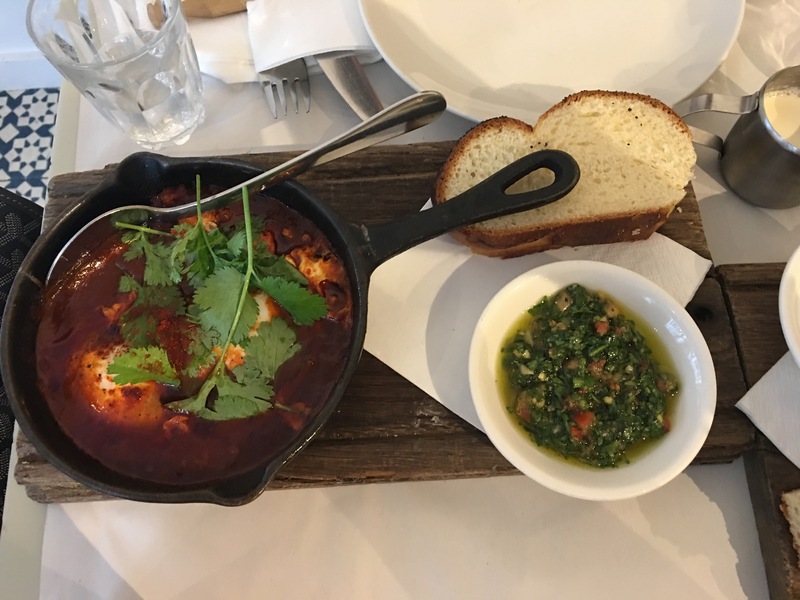 Although our waitress did say the eggs would be runny, when plated up, the Green Shakshuka was more thick soup than poached eggs. Their saving grace was the delicious blend of flavours. Their coffee was so good, I had two, but not before we ordered some dessert. The best foodies will always do a quick Google before trying out a new restaurant so Shilpa knew exactly what she wanted: the famous “cheesecake”. I on the other hand ooh’d and aah’d at the window display before finally settling on the chocolate, hazelnut and cinnamon babka. 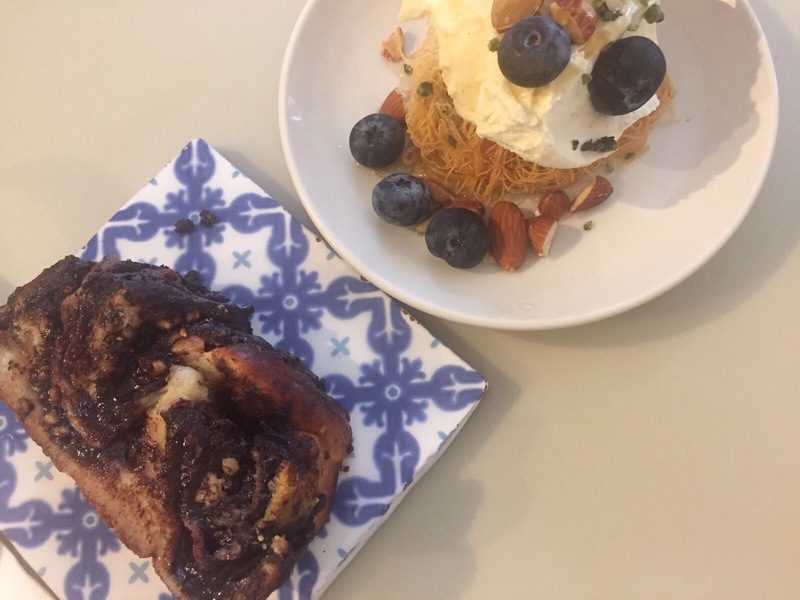 We shared both and I can tell you, I’m so glad we decided not to go for the mezze, leaving enough room for the sweet goodness that was their dessert choices. 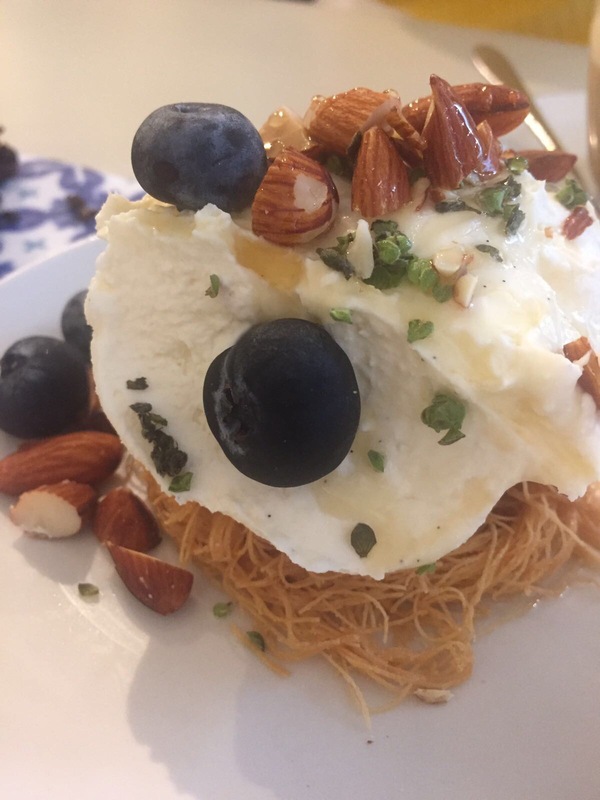 The cheesecake was a whipped cream cheese placed on a bed of shredded filo, topped with honey, nuts and blueberries. Babka is a sweet leavened bread made with a rich dough and while it is typically flavoured with raisins, the chocolate and hazelnut version hit my sweet spot without the cinnamon being too overbearing. We ambled out into the sunshine at 12:30, thoroughly satisfied. I love a good brunch and in this case, the company and the food were both stellar.